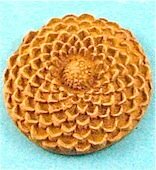 A bronze clay pendant made from Fast Fire Bronzclay 100 Gm, molded in a flexible push mold. Using basic metal clay tools this pendant is very easy to make and can be changed to suit the large variety of molds and cutters available. Bronze clay is suited to this project due to its ease of use and flexibility. Step 1. Lightly spray your hands with either cool slip or rub a few drops of oil on your hands then rub over your rolling mat and on your roller. A plastic report cover makes a very good work surface as the insides can be oiled and the material placed in between the covers if it needs to be rolled. Make sure the top sheet is not too thin as it may crinkle during the rolling process. The rolling pin does not need to be oiled if a report cover is used. Step 2. Roll material into a ball and place in the centre of the mold. Press firmly, spreading the clay into mold making sure that it completely fills the mold right to the edges. Gently run your roller over the back of the clay making it as level as possible. This last step is important as it will cut down the sanding required when the piece is dry. Wait for the clay to settle in the mold (approximately 15 to 20 minutes depending on the temperature) then gently remove it from the mold. Remove any excess from around the edges of the molding using a craft knife, place the piece on a piece of plastic on a flat surface and dry according to the manufacturers directions. You can tell when your it is fully dry by placing it on a mirror for five seconds. If there is condensation on the mirror when you remove the piece, then the piece is not yet dry. Once the piece is completely dry use either a medium grit sanding pad or wet and dry sandpaper to ensure that the rear of the disc is flat and even, finishing off with fine grit. Use a circular motion so that you get an even edge.Clean up molding as required. To make a bail take a small piece of clay and roll between a two card high stack of playing cards. Cut strip into a 1/4" width and roll around drinking straw, as per photo, trim ends if necessary, paint with water and join. Apply water and gently fix bail to the rear of the moulding, brush both surfaces so that they are joined together. Allow to fully dry before firing. Step 5. 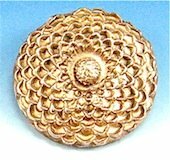 Unlike precious metal clay, bronze must be embedded in a container of coconut shell based activated carbon or activated coal carbon, to prevent oxidization of the bronze. The container may be stainless steel or ceramic. Pieces of stainless steel may flake off from outside the container during firing and leave a black residue in the kiln. Always follow the manufacturers instructions when kiln firing metal clay. Step 6. After the pendant has been kiln fired and cooled, brush with a stainless steel brush to smooth the surface and give a nice bronze appearance. The piece can be polished in a tumbler with stainless steel shot. Hand burnishing will also give a nicely detailed finish. Clean tumbling container and shot thoroughly after polishing bronze. The bronze pendant can be rubbed with carnauba car wax to protect the finish and to prevent tarnishing.